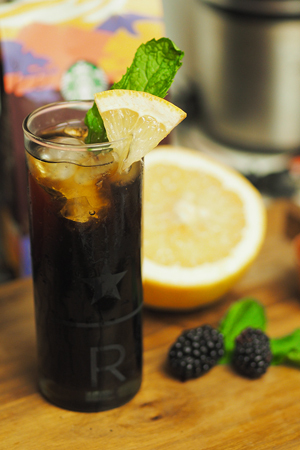 A few months ago, Starbucks announced the reformulation of their at home coffee lineup in stores. Many core coffees were removed, and a new wave of promotional coffees have been added. I won’t lie, my heart almost stopped when I saw we were discontinuing Kenya in our stores. My go to iced coffee in the summertime. Of course there are so many other great coffees to choose from, but Kenya has my heart. I was grocery shopping at Safeway the other day, and it doesn’t matter if I need to go down the coffee aisle or not, every time I go to the grocery store, I wander down the coffee aisle just to see if there is anything new. On the bottom shelf, I saw these bright, colorful bags. I picked one up and couldn’t believe my eyes. Kenya was in Safeway, along with Brazil and Costa Rica. Of course I had to buy them all and fall in love all over again…. Well, hello there! It’s been a little while. I took a little social media hiatus, but now I am back and ready to get back to business! Recently, I noticed Trader Joe’s started stocking this pink grapefruit marmalade, and I knew immediately what I wanted to do with this. 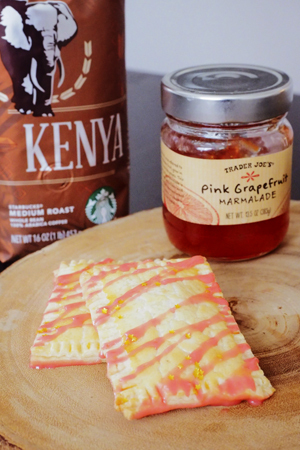 With it’s unmistakeable grapefruit notes, this marmalade scream to be paired with our core Kenya. These pop tarts are so simple to make, but they make for a perfectly impressive coffee tasting. The word coffee originates from the Arabic word ‘qahhwat al-bun’ which was then shortened to ‘qahwa’. The Turkish called it ‘kahve’ after which the Dutch made it ‘koffie’, until it was finally translated to ‘coffee’ in English.